I don’t know whether St. Valentine was a hugger or no, as there is not a lot of information known of him. I am the Hug Machine! And right off, the lucky young reader is launched off on an introduction to a young boy that calls himself the Hug Machine. I am very good at hugging. No one can resist my unbelievable hugging. I am the Hug Machine. Through a literal footstep trail, meandering in tracks on the sturdy pages of this board book, the Hug Machine models the attributes of hugging and its effects on the ones hugged. And, there is literally no one and nothing exempt from the ministrations of this small tub of love called the Hug Machine. Trees, mailboxes, benches and even fire hydrants, come under the inanimate sway of this tot of towering touchable urges of a very sweet kind. Tall bears and small turtles, soft sheep, hard rocks, ice cream trucks, and even SNAKES, are huggable to him. But, even the Hug Machine can encounter a challenge with a verrrry spiky porcupine that has experienced a dearth of hugs due to his pointed protuberances. Well, yes! NOTHING deters the Hug Machine! Mitts, a face mask and a sturdy body apron round the body of the Hug Machine makes hugging doable. The result is a peaceful and pacified porcupine. A day of hugging takes much energy and the Hug Machine is fueled by his favorite food; pizza, natch. But, even the Hug Machine can reach the end of seemingly unending energy, even in such a worthy endeavor, and his momentum lags. 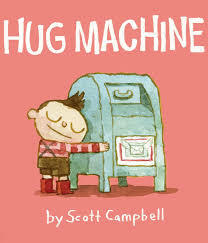 But, on this supposedly lagging low note, Scott Campbell does a quick turnabout and gets the board book, “Hug Machine,” to end on the highest of notes. He, the Hug Machine, ends the day in the arms of a hugger extraordinaire...mom, of course! For, truth be told, just where do you think the Hug Machine learned his initial technique? It was modeled by mom, of course! Scott Campbell’s Hug Machine, with its meandering maze of huggable types, animate and inanimate, teaches young readers that touch provides a connectedness that the current culture is much in need of, and Scott Campbell’s approachable and softly soothing illustrations dovetail perfectly, and will draw young readers into this happy world. All I can say is, with no disrespect to the Hug Machine….Wanna Huggle?